Text of the Oct. 23 letter from Massachusetts religious and environmental leaders, representing 350.org and Climate SOS, addressed to President Obama, Sen. Kerry and Rep. Markey, on the occasion of the President's appearance at Massachusetts Institute of Technology. Dowloads of text and graphic are available below. Please send correct name and title of additional signators to greenhousejp@gmail.com. 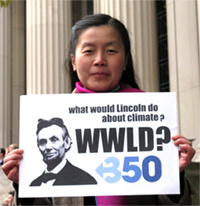 above, Maggie Zhou, Mass Coalition for Healthy Communities, Climate SOS, at MIT action outside President Obama's address; left, Zhou and Ken Ward, JPGH, 350.org, Climate SOS, dressed as President Lincoln. Our nation faces the greatest threat to our security and well being and the most profound moral challenge since the great struggle to end slavery. We were blessed, then, to be led by another tall, slim politician from Illinois. The terrible prospect of climate cataclysm, though just as grave, is more encompassing and final, and demands Presidential leadership of a higher order even then called forth in President Lincoln. Lincoln triumphed over partisan politics and a ghastly civil war, but he did so by hewing to a moderate course, never straying beyond the boundaries of the national civic debate. As a student of Lincoln, you know well that the 16th President long resisted efforts to change the character of the national conflict from a political matter of secession to the moral imperative of ending slavery. When Lincoln issued the Emancipation Proclamation, he was fully convinced that no compromise measure would be acceptable to proponents of slavery. The immense, rushing threat of climate catastrophe allows no such middle course, because there is no time for evolution of the political debate. You must decide the essential moral and practical question now; geophysical reality does not permit the luxury of waiting to be ìcontrolled by events,î nor dilatory small steps, such as the bills sponsored by our own Senator Kerry and Congressman Markey. It is now imperative that you accept the great responsibility of recasting the fundamental question facing humanity - there is no one else in the world with the authority and power to do so. The question before us must be simplified and the scale, nature and timing of a functional global response set before the nation and the world. The first, inarguable step in that direction is to endorse the goal of 350 ppm (or less, as most recent evidence suggests). We must acknowledge the challenge, no matter how high the hurdles. By embracing this necessity, you bring policy and politics into line with climate realities. You also take a tremendous political risk, it is true, and open a Pandoraís Box of challenges to the utterly inadequate mechanisms of the American Clean Energy Solutions Act. This is necessary if we are to even begin grappling with the true scale of risk and fundamental nature of the solutions we must embrace. Eventually, President Lincoln came to the right decision, choosing Emancipation over gimmicks like repartotion. Given his strength of character and acuity of sight, it seems likely that he would have reached the same conclusion without the luxury of time, as you must now do. 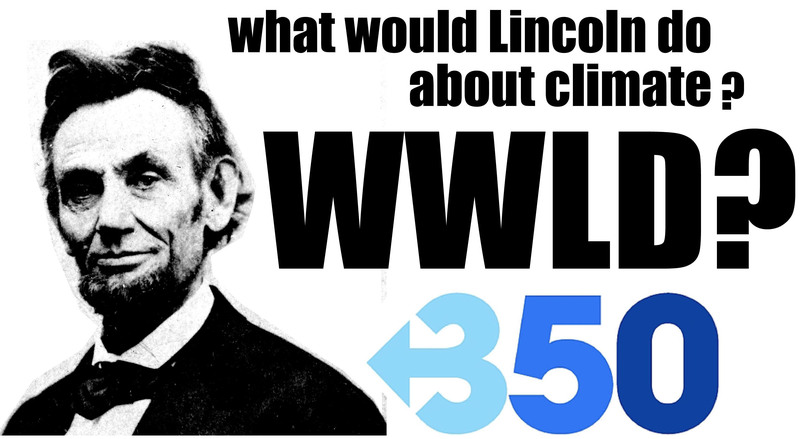 We urge that you consider the question, ìwhat would Lincoln do?î and act accordingly.